The Internet is only about 8000 days old. 2.5 billion people and 37 billion things will join the Internet by 2020. However, it is expected that 50 billion “new things” will connect to the Internet by 2020. It is clear the next generation of the Internet is coming and we are discovering new values associated with a more connected world. Beyond the promises of the Internet of Things (IoT), dangerous situations can, and will, arise from hackers or human error if the proper security and protections are not put in place. Securing the Internet of Things is not going to be one silver bullet solution to just plug in and forget about. Instead, it will be a million ideas created across both control and technology engineers. 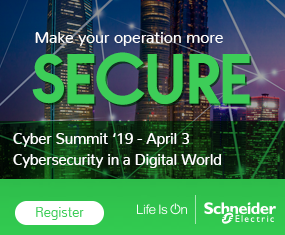 Vendors are now working together to develop best practices and blueprints for securing things, data generated from those things, and the automation of those things across different industrial environments. So how do you contribute to this community to help secure the Internet of things? 1. Well first, join the communities that are driving these discussions. There are many consortiums and groups being formed, to name a few the Internet of Things World Forum, Industrial Internet Consortium, ISA and ODVA. 2. Don’t break what already works – Security cameras, authorized personnel security areas, firewalls, identity and network profiles and other capabilities have worked in both IT and industrial environments. We need to use these common sense ideas to prioritize areas of vulnerability to ensure security is easily managed. 3. Identify connected things that require remote access. In industrial environments many connected machines will have built in intelligence to alert owners of maintenance before things break, or enable servicemen access to the machine remotely for faster servicing. As you add these connected machines to your network, you need to be sure you separate securing the data from the machines from the access to the machine operations. This way machine service vendors and third-party partners can maintain machines ,and or systems, to troubleshoot automation, without gaining access to private data. Also, security rules can end up managed by the network, such as access to certain systems, networks or machines at certain times of the day by certain validated people, etc. 4. Quantify the ROI on security. Balancing costs of security to what is being protected is often challenging. Companies look at risk assessments of losing data as well as shutting down of systems. Knowing when and where to put security so it doesn’t negatively impact operations is also a challenge. By making it easier to manage security, remote access, etc. through automation security profiles, at the network level, you can dramatically lower some of your security operational costs. Identifying ahead of time the impact of a security protocol or policy on the operation of delivering data needs to be quantified and risks need to be identified when securing IoT. 5. Share your ideas. Security is everyone’s priority including operations and technology engineers. Everyone should be thinking about it and sharing ideas on how to make it easier to manage security while protecting the IoT. You can share these ideas with your employers, your favorite consortium, and/or with Cisco. Cisco is offering prizes of $50,000 to $75,000 for top ideas that solve the security challenge of the IoT. IoT is not a futuristic trend that may or may not occur. It is here now and it is growing so securing IoT needs to be a top priority for everyone. The IoT is progressing and driving more value everyday. With each passing day, month and year, the momentum for IoT moving forward could show greater benefits, or it could come to a halt if we do not use common sense security solutions to secure the valuable data, systems and machines. Guido Jouret is general manager and vice president for the Internet of Things Business Group for Cisco System Inc. Prior to this role, he was chief technology officer of Emerging Technologies Group at Cisco.